Need to cover your braces because they're rubbing the insides of your mouth? This product will help. Bracket Jacket is a custom braces guard that you form at home with hot water (thermoformed). It covers both the front and back of your teeth and prevents discomfort caused by sharp brackets and wires. Great for lingual braces (on the back of the teeth)! This clear guard allows teeth to move, and leaves space to wear rubber bands. It's really easy to custom fit the guard, and full instructions are included with the product, as well as the manufacturer's 800 phone number to call for assistance or questions. Just heat the Bracket Jacket in hot water and press each tray to the teeth with braces to fit over and around the hardware. During daily wear, just peel Bracket Jacket off and then press it on to fit back into place. When it's formed, the Bracket Jacket becomes relatively clear, like a clear aligner. You can occasionally eat with the Bracket Jacket in place, but it is not recommended on an everyday basis. You can wear Bracket Jacket for light contact sports (such as wrestling) as a mouth guard (it covers all biting surfaces; however, it does not protect from concussion). It's a great device to wear to protect your mouth when you sleep. And yes, it will work for lingual (behind the teeth) braces, with extra patience when forming the device. To clean Bracket Jacket, just rinse it in cool water or brush it with toothpaste. You can also use a retainer cleaner, such as Retainer Brite, SonicBrite, DentaSoak, or OAP Cleaner to kill any harmful smelly bacteria growing on the device. Each package includes two trays (one for the top teeth and one for the bottom teeth) and full instructions. Bracket Jacket is manufactured from FDA-approved soft EVA material, and is free of BPA, phthalates, and latex. Buy two packages and save one for later if your teeth move months from now! You get 2 Bracket Jacket Covers per package (one for the top teeth and one for the bottom teeth). Buy two packages and save one for later if your teeth move months from now! Form the custom guard with hot water. Full instructions are included with the product, including an 800 number for the manufacturer. Bracket Jacket contains no latex, BPH, or phalates. 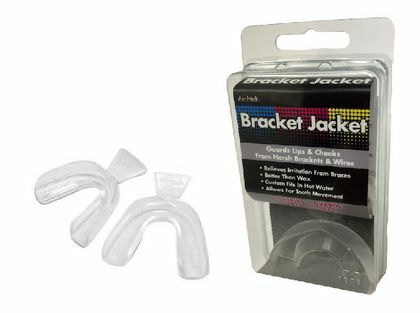 Bracket Jacket is a great idea -- a custom heat-formed guard for braces wearers! It allows for tooth movement and rubber bands. On days when your braces are driving you crazy, this product could be a lifesaver! It's made by a US-based company that specializes in quality dental products. Hi. I have a nine year old dsughter who is having a very difficult time with her braces. Because of her specific situation she needed to be treated at a young age, and so she hasn't lost all of her baby teeth. She has brackets on the top and bottom 4 teeth, and then on all 4 back teeth to attach the wire. The problem is this means the wire isn't attached to any brackets on the sides of her mouth, and so she has trenches--lines on her inner cheeks that are cut and ulcerated by the wire across the sides of her mouth. It's a nightmare. We've been sticking gum on the sides of her cheeks to block the wire, but as you can imagine, that doesn't work very well. But we're really at a loss and she's miserable. Would this bracket jacket work for her, or is there another product that you think would help? Thanks in advance. Thanks for writing, Kimberly! Yes, I would recommend giving the Bracket Jacket a try. I think it might work well for this situation. Read the instructions carefully - this is a product that is custom-formed to the teeth ("boil and bite"). Be sure to tell her orthodontist what you are doing as well. You would want to get his/her opinion to ensure that they don't think it will interfere with the treatment (it shouldn't). The product was developed by a company that specializes in orthodontic products. This works like a mouth guard. But its quite small for an adult. It only covers the front half of my teeth. I would buy this again if it was larger. Also it isnt as thin as they make it look or sound. I cant even imagine trying to eat with this in my mouth. Merchant Response:Thanks for your review! The Bracket Jacket isn't meant to be used while eating. It is a protective mouth guard to be worn for sports, while playing musical instruments, or while sleeping. Doesn't cover the back molar (where often there is a lot of pain) but does a great job on the front teeth. I was using wax like crazy, it would fall off and I was too scared to sleep with it cause I was afraid I would swallow it and choke. These are great cause my teeth are extremely crooked and bucked too as well. It perfectly shapes to every bracket and tooth. Once it is on it is VERY secure. These should come in your braces kit from dentist not that stupid wax. C'mon ortho wax is so 2002. Get with the times. ProsSuper easy to use. And love how you just keep putting it in hot water to adjust the shape if you are not happy with the 1st try. ConsI wish they were longer cause they do not go across my whole mouth.So my back teeth still dig in my cheek.